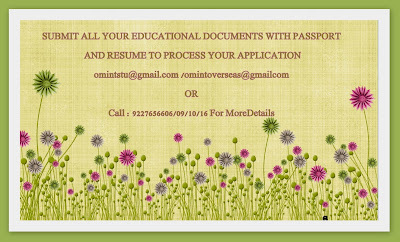 OM VISA Consultancy - Global Immigration, Students, Visitor, Business & Work VISA Consultants: Hurry UP !!! !Ontario Immigration Nominee Program- Express,Entry sub-category is currently accepting ICT occupations with lower Score,Achieve Success in Your Overseas Dream With Support From "OM INTERTERNATIONAL"
Hurry UP !!! !Ontario Immigration Nominee Program- Express,Entry sub-category is currently accepting ICT occupations with lower Score,Achieve Success in Your Overseas Dream With Support From "OM INTERTERNATIONAL"